Courtney Wallace is surrounded by girlfriends who have found their perfect matches and have settled or are preparing to settle into marital bliss, several of them already happily pregnant. Although Courtney is happy for her friends, the thirty-six-year-old special events planner at Eagle Hall Manor hears the ticking of her biological clock without much hope that she will find an HEA of her own. Jaded, she has little confidence in the pool of eligible men, having decided that most of them can be identified as one of several loser types: the Man Baby, the Nice Guy Not, the Space Invader, the Too Selfless to Be True, the Emotionally Unavailable, and the worst offender-- the Hook-up Artist. She quickly writes Matthew Lyndon off as a player. When she learns about his bet that he can defrost Ice Queen Courtney in two dates, she labels him a Hook-up Artist and decides to teach him a lesson. Matt has recently returned to Shenandoah Falls, Virginia, where his family is local royalty. He has done so reluctantly, but when his job in government affairs in Washington, D. C. dries up and none of his efforts to find another one proves successful, he comes home and joins his father’s law firm. As a middle child who feels that he has never earned his father’s approval, he is prepared for a certain level of discomfort. Badly burned by a past experience, his level of trust in romance is as low as Courtney’s, but he finds her attractive enough to disregard the fact that she is ten years his senior and determined to resist him. Matt is constantly forcing Courtney to reconsider what she thinks she knows of him. His gift of roses may be predictable, but his Shakespeare quotations are not. No mere player would give himself as wholeheartedly to a pro bono case for tenants in a low-rent building as Matt does. But Courtney and Matt will have to move beyond their pasts and learn to trust each other if they are to build a future together. 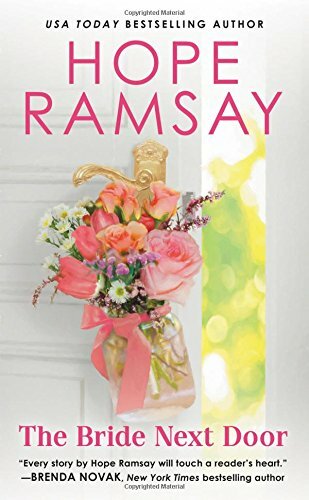 This is the fourth novel in Ramsay’s Chapel of Love series. It is rich in small-town appeal, family dynamics, and the ties of friendship. How much readers like the book will depend largely upon how much they like the protagonists. Courtney and Matt are not immediately sympathetic characters. Since simplistic labels are a pet peeve of mine, I had a hard time liking Courtney. Matt behaves like a jerk initially, but I found him easier to like since it is clear early on that there is more to him than his player façade. Eventually, I was invested in both characters and rooting for their HEA. And I loved the start of a romance between a Jewish legal assistant/singer-songwriter and an Irish bartender. I hope we see more of them in an upcoming book. If you like small-town romance with heart and a sure contemporary touch, add this one to your list. Fans of the series will likely enjoy seeing characters from the earlier novels, but it is not necessary to have read the first three novels and two novellas to enjoy this one. Putting on my list. Sounds vg. Thank you ----every review and I find another book that I would like to read. It sounds like a wonderful series to sink into. Sounds like a great book and series. Thanks for the review. This book sounds so good thanks for the review will have to look for it soon.